New arrival Ombre 613 blonde weave extensions, with great color and the hair will last for a long time due to it is virgin hair. 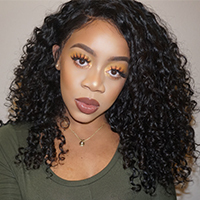 Brazilian virgin hair weave is the best-selling hair products online, Ombre hair is the hottest trend and loved by a lot of women. The hair has a dark #1b color on root, while its shaft and end are all in #613. For girls who want to try a bold color and get the most attention in night club, then Ombre 613 blonde weave will be the best choice. All our hair products are well packed before shipping, there is no smell and shedding. All hair products from New Star are using 100% human remy hair, which is collected from the donors all over the world, so our hair could perfectly match all human races and different skin tones. Because raw hair material is unprocessed, so the hair can accept any styling options, like straightening, curling, dying, bleaching, etc. Wearing these bundles allow to restyle your hair without worrying to damage your natural hair.